A woman was arrested yesterday at the Kotel (the Western Wall) in Jerusalem and questioned for wearing a Tallit (a prayer shawl) in the women's section of the Kotel. According to a Jerusalem Post report, the woman was fingerprinted, photographed and detained for three hours for wearing a men's Tallit. 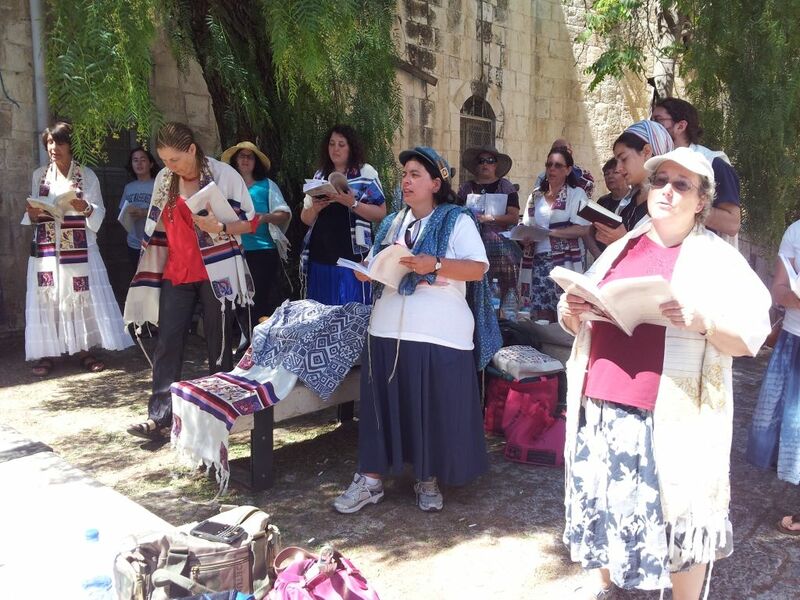 The incident occurred during a monthly Rosh Hodesh (New Month) prayer service organized by the group Women of the Wall, an organization in Israel dedicated to fighting for religious equality of women and in particular, the right of women to conduct a Torah service at the Kotel. According to an Israeli law from 2001, it is illegal for women to perform practices at the Kotel that are normally performed by Orthodox men. This is includes wearing a men's style Tallit or putting Tefillin (phylacteries) and it also includes a ban on women reading from the Torah. As part of a "compromise" the Israeli government has allowed mixed events including mixed prayer and Torah reading at the Davidson Centre - at the south wall of the Kotel. But the actually Western Wall is overseen by Orthodox religious authorities. This means that the Kotel is divided so that it has a women's section and a men's section. Women are not allowed to bring a Torah scroll into the women's section or to pray or sing out loud. Effectively, in a society in which only a minority of the population are Orthodox Jews, the Israeli government has ceded control of a site that is holy to all Jews to a minority Orthodox population exclusively. It is time that the Israeli government reviewed the way it oversees religious affairs in Israel. Perhaps this new governing coalition (with the addition of the centrist Kadima party led by Shaul Mofaz) will try to address some of these issues. After announcing last month that it would begin funding Conservative and Reform Rabbis (to a limited extent and with limited roles - while still not recognizing their rights to perform weddings or funerals), the time has come for the Israeli government to review the rules pertaining to the Kotel along with a range of other rules and laws relating to religious affairs in the country..
For starters, the government should implement a three section solution at the main wall instead of the current two section division - the Kotel should have men's, women's and mixed sections; The government should also overturn all of the laws relating to women's prayer at the Kotel - in the mixed or women's sections - whether out loud, in groups, while wearing a Tallith or Tefillin. As a compromise, the Orthdox and ultra-Orthodox should be able to continue to control part of the Western Wall area and to conduct prayer as they see fit in that area. Some Orthodox and Ultra-Orthodox have argued that this is a holy place and that, as the most rigorous adherents of Orthodox Judaism, they should be able to oversee the Kotel and should have the right to bar practices that they view as inappropriate and otherwise dictate the site rules. They argue that the Women of the Wall are simply being "provocative" by wearing their prayer shawls in public and that women should not be able to pray out loud anywhere near the Kotel. But the Kotel does not and should not belong to the Ultra-Orthodox or even the Orthodox. It belongs to Jews of all denominations and of both genders. And all of these Jewish people should have the right to access the Kotel even without following ultra-Orthodox practices. The public observance by the Women of the Wall of Rosh Chodesh is not something that should attract police attention, arrests or other forms of public humiliation. Rather it is those who would prevent women from praying in public who should be monitored. A Kotel divided into three sections would be the best way of dealing with this as it would be a compromise that all sides could complain about equally. A pluralistic approach to Judaism at this important symbolic and holy location would be a key message for a more pluralistic approach to Judaism throughout Israel. This would be a significant step towards improving gender equality in Israel generally.